In Game of Thrones, people often swear by the “old gods and the new.” So far at least, the southern worshipers of the new gods (that is, the Faith of the Seven) seem to be relatively tolerant of the old gods in the North. (The southerners simply sneer at the primitive beliefs of the northerners; they don’t try to kill the northerners for them.) There are interfaith marriages (Ned and Catelyn). And, in the books, Sam even converted from his childhood faith of the new gods to become a believer in the old gods. In short, Westeros is a place that tolerates multiple religious systems, not unlike the late Roman Empire and the early Middle Ages. We tend to think of the High and Late Middle Ages as periods of religious intolerance – the Inquisitions and burning heretics at the stake are just two examples. Some periods during the late Roman Empire and early Middle Ages, however, were surprisingly tolerant as regions began to drift from pagan worship over to Christianity. During the early Christian period (before 325 CE), the Romans practiced many religions, including Judaism, the worship of the classical Greco-Roman Olympic deities (like Zeus, Athena, Apollo), the worship of imperial rulers, and other newer emerging religions. As Christianity spread, Norse and Germanic, Slavic, Folk, and Celtic religions all influenced Christianity. Ancient artwork reveals that early Christianity incorporated “pagan” elements as the faith was born. The mosaic below is from a vault in the Tomb of the Julii, which is in the papal necropolis under St. Peter’s Basilica in Rome. In the mosaic, Christ is depicted as a triumphant sun-god Sol Invictus (or the Greek Helios) with sunbeams shooting from his head. Two rearing horses pull Christ in his chariot. (( See the details associated with this image. )) There are Dionysian vines in the foreground. Mosaic of Jesus as Christo Sole (Christ the Sun) in the Tomb of the Julii in the pre-4th-century necropolis under St Peter’s Basilica in Rome. Image: Wikimedia Commons. As the centuries passed, this process of fusion and coexistence replayed itself as states, including parts of England, converted to Christianity. At the dawn of the last millennium, the old gods still roamed the English countryside, where they sometimes held hands with the (Christian) God. Although Christianity began to carve its path through Anglo-Saxon England, even as late as the eleventh century the old gods held sway in some country villages. After all, the word pagan1 comes from the Latin word for countryside, pagus. The symbol of the Faith of the Seven, the seven-pointed star. (c) HBO. In Game of Thrones, the “old gods” are the nameless deities of stone and earth and tree – and the northmen, wildlings, and crannogmen still worship them. In southern Westeros, people follow the new gods. But, a red god from the east, the Lord of Light (R’hllor) threatens the Faith of the Seven’s supremacy. In the Greek mythology, Dryads are tree nymphs or spirits. Image: “The Dryad” by Evelyn De Morgan, 1884-1885. The Westerosi old gods are reminiscent of the Greek mythology and even the Naiads and Dryads of Narnia fame. 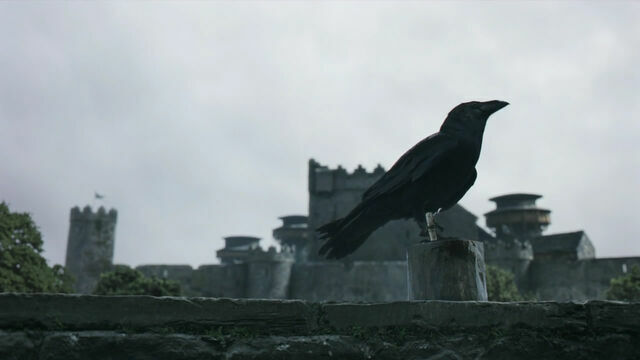 The Westerosi old gods also evoke shamanism and animistic faiths (the latter of which is the belief that non-human entities like animals or plants possess a spiritual essence). Still it is possible to see traces of the coexistence between the old gods and the new gods in England during the Anglo-Saxon and even early Norman period. The face of a heart tree. (c) HBO. In Alfred the Great’s family history, the ninth-century Anglo-Saxon king claimed ancestry back to the biblical Noah and Adam and Eve. On those same pages, however, Alfred also proudly proclaimed that he hailed from the mighty Germanic god Odin2 and even Beowa (or Barley). This last pagan figure, Beowa, is associated with grain and agriculture. He may have inspired the folk legend of John Barleycorn, whom like the grain harvest, suffers, dies, and is reborn. One poem notes the “reviving effects of drinking his blood.”3 In modern-day popular culture, however, John Barleycorn’s blood is often a metaphor for alcohol (due to the title of Jack London’s autobiography). When Ethelbert eventually became a Christian, he did so because he recognized Christianity offered better prospects for himself and his kingdom. King Redwald of East Anglia (560 to 620 CE) hedged his bets by having two altars built side-by-side. The king consumed the Christian sacraments of “bread and wine” at one altar and sacrificed to the old gods on the one beside it.5. The Godswood at Winterfell. (c) HBO. The process of overlaying Christianity on Paganism is famous. Numerous articles cite the pagan origins of the fertility-celebrating Easter egg and the Christmas tree born of Winter solstice and Yule. But the strategy goes much deeper than substituting Pagan feast days with Christian celebrations. In the ninth century, Pope Gregory suggested that England’s pagan temples be converted into Christian churches “in order that the people may the more familiarly resort to the places to which they have been accustomed”6. In Germany, Christians chopped down sacred oak trees and built a new Christian church with the wood. In France, Christian missionaries built churches on pagan burial mounds. A chapel built on a pagan burial mound, Tumulus Saint-Michel, in Carnac (France). Image: Wikimedia Commons. This tactic of conversion by swapping out and overlaying paganism with Christian symbols occurred at an everyday level as well. Instead of sacrificing to Mother Earth, the Christian church encouraged people to pray to the Virgin Mary. The Church accepted that the names of the Anglo-Saxon days honored the gods.7 They allowed Sun-day and Moon-day and tolerated the days that honored Norse gods — Tiw’s-day, Woden’s-day, Thor’s-day, and Frig’s-day – as well as Roman (Saturn’s-day). The old gods “died hard” as people transitioned to Christianity. Sometime between 900 and 950 CE, the Scandinavian descendants dwelling in Gosforth, England carved a fourteen foot red sandstone cross. Norse gods like Loki, Heimdallr, Víðarr, and Thor prance across the Gosforth Cross8. But, Christian symbols – like Christ’s crucifixion — mingle peacefully with them. And, some historians speculate these symbols may be evidence that people illustrated their Christian teachings through pagan stories. A close up of one of the carvings on the Gosforth Cross; this carving is typically interpreted as depicting Víðarr tearing apart the jaws of the monster Fenrir during their legendary battle at Ragnarök. Image source:9 Wikimedia Commons. Westeros’ religious struggle between the old gods and the new is, so far, fairly low key. This may well change, however, as the religious temperature in Westeros gets turned up with the emergence of the fanatical sparrows. Meanwhile, a competitor – the worship of the Red God or the Lord of Light (R’hllor) – creeps in from the East. As we watch Melisandre and Stannis “purify” heretics through fire, it isn’t hard to imagine that this faith will come into conflict with the Faith of the Seven. Still, it seems like the worship of the old gods – with its ties to the North and nature – are a possible antidote to the threat north of the Wall. Is there one true faith in Westeros? What belief system will ultimately triumph, or are all beliefs equally valid? What do you think? Very interesting. Falls into my current reading dealing with Celtic history. Thank you. I love this Jamie. I am also wishing you a Pagan Happy Beltane from me, on this first day of May ! Sorry for the delayed reply! Happy Beltane! (Or belated Beltane.) I’m so happy to hear you liked the article. I really enjoyed doing the research for it. I love quotation I found from King Ethelbert: “I cannot abandon the age old beliefs that I have held… But since you have travelled far, and I can see that you are sincere in your desire to impart to us what I believe to be true and excellent, we will not harm you… Nor will we forbid you to preach and win any people you can to your religion.” His words are so filled with tolerance. How did this spirit of tolerance get lost? It is really sad. It amazed me to discover more religious tolerance in the Anglo-Saxon period than in the late Middle Ages. We tend to think that we progress through the ages, but clearly this is not necessarily the case. I know little about Ostara – very interesting. There’s a typo in the article. It says ‘Viorr’ instead of ‘Vidarr’. Also, GRRM said that there is no one true religion in Westeros. They all have have certain truths, certain false teachings, and certain powers/magics. That seems to reflect GRRM’s agnosticism more than anything else. He doesn’t view certain faiths as more correct than others. Martine, Ostara is actually borrowed from Easter. Bede mentioned an Anglo-Saxon goddess named Eostre in The Reckoning of Time (though the actual worship of Eostre is debated amongst historians). The festival of Ostara was created by Wiccans in the 1970s. Thanks. Originally, I had spelled it as “Víðarr” but I think it might have been autocorrected somewhere between Word and WordPress. That’s a good point. I meant question somewhat figuratively — more about which faith will win than anything else. There seems to have also been economic reasons. Leif Ericson may have converted and encouraged others to convert for more opportunity for trade with lands ruled by Christian kings. In the books so far, religious conflict has been relatively restrained and mostly appearing in Stannis’ own court (note that he even specifically refuses any burnings of nonbelievers because they make up so much of his army), though with two books left it could change rapidly. In the show? Who knows, it’s changed so much that we can’t say. We’re certainly seeing the rise of revolutionary religious sentiment supplanting secular authority in Kingslanding. I agree. I could be very wrong but I think that GRRM is setting up for some type of religious revolution in King’s Landing – almost like in Constantinople with the Turkish invasion/fall in 1453. But, if he is doing this, it is subtle because right now – except for the rising temperature – things are relatively smooth. A friend of mine compares what is happening in King’s Landing with the Ayatollah in Iran. Also, interesting comment about Leif Erikson and trading. I’ve never heard that before. Andrew, that’s a great comment. Many thanks. I don’t usually write about that here, it’s just that the subject matter of this particular blog was obviously of particular interest to me in that respect. I usually just stick to history here , as I absolutely love Jamie’s site and am so fascinated by the historical sources she points out – and the discussion that follows! It’s wonderful. This is a lovely comment – thank you for note only your kind words but also for sharing your own faith. I really enjoy hearing from people with diverse views; the world is such a rich place. I’ll have to see if I can find some other ways to write about older religions. I really enjoyed writing that article. Re: religious tolerance. I think you are right. Religious intolerance and tolerance are both present in history at different periods, and at the same time in different countries. For example, Spain enjoyed a long period of coexistence under Moorish rule until the Catholic kings and queens ruled. A lot of religious intolerance we see throughout history is rooted in economic and political conflicts. Religions are a convenient excuse to separate people into different camps and have them fight each other. Re: religions in ASOIAF. I am most fascinated by the Faceless God. In the House of Black and White, the Kindly Man told Arya that they have every god in Westeros and Essos in the temple, but they are all merely manifestations of one single god. And it is hinted that this god is death. It makes perfect sense. I am not a theologian so I might be wrong about this — It seems that all established religions revolve around the central issue of human’s fear of death. I strongly agree about the economic and political conflicts. I wonder if the Faceless God is a bit like the Hindu goddess Kali or something. Yes, that’s right. I didn’t really allude to it in the article – in fact – I probably “mis-wrote” on this point, but I remember reading that the smallfolk don’t understand the septarchy (?) – is that the word they used? I don’t remember the smallfolk part. It wouldn’t surprise me. I’m watching Wolf Hall, in which it was mentioned that the smallfolk could not read the Bible — in fact it was heresy to translate the Bible into English, and Tyndale was killed for it. I think GRRM said somewhere that the Seven Gods are closest to Catholicism’s concept of Holy Trinity. The church structure is also similar to Vatican. Interesting point about Kali. She is probably the most aggressive and destructive god(dess) in Hinduism, more so than any of the male gods. Even Shiva had to lie down and appease her to halt the annihilation of the universe. While religious intolerance began to rise with time, a lot of it had to do with the beginning of the Reformation taking place (specifically I’m thinking of the Hussites and the Lollards) that they simply were ahead of their time for. Religious intolerance more often then came from within the own religion rather than from outside the religion. What the medieval church couldn’t stand was alternate interpretations or multiple interpretations–and there’s a perfectly sound reasoning behind it: with the fall of the Roman empire, the Roman Catholic Church became an imprompteau unifying governing body that worked to try and bring everyone back together in the Church. And all these people who were speaking germanic (and other) languages who needed to be converted had to trust the priests and missionaries who came forth with them. It’s sort of like if aliens came down and said, “you’ve got the bible, but you’ve got it as it was written for kindergartners… we have a better form of the bible… only problem is that it’s written in alpha centauri… but we’re willing to translate for you.” The Church derived a lot of power out of the fact that the successor states and kingdoms of various Germanic peoples couldn’t read latin most often, and they played up that card to the hilt in their conversions. We have the one ticket to save your soul, and only we can understand what’s being said. It gave the Church a lot of power, and slowly it began to really carve out for itself a position of power in other ways, but all of this was built upon the fact that not a lot of people could read the bible. So when people began popping up and said “hey, lets translate the bible and give it to them to figure out for themselves and dispel a lot of these weird folk traditions we’ve been tolerating (John Wycliffe famously had to comfort a distraught mother that her dead unbaptized infant wasn’t going to turn into a firefly) that were a mixture of older pagan beliefs and Christianity,” yeah, of course the church is going to step in and squash it, because it’s a direct threat to their main source of power which has allowed them to have direct power over kings and princes and made them extremely wealthy. One podcast (from which I took the alien metaphor) put it that when the Catholic church had to act as a governmental institution (which it never was intended to be) after the fall of Rome, it developed all the problems of a governmental institution. Religious intolerance is much more a thing of the Renaissance though than the Medieval era, and what religious intolerance was in the Medieval era often had more to do with trying to keep a lid on heresy within their own religion rather than worry about outside religions. As you mentioned, the early Christians could roll with pagan religions and use them to get across their Christian beliefs through melding the two together. But a question of doctrine within their own religion? That had to be stamped out and often was done so violently. So when talking about religious tolerance levels it should be done with that disclaimer imo. Though I do feel the need to mention this: there was of course there were just times when Charlemagne rolled in and slaughtered a bunch of Saxons who decided to go back to their old pagan ways, after having converted to Christianity. Depending on where you are (for instance, the Baltics and Eastern Europe), the Medieval Catholic church definitely was intolerant of other faiths. However, is the Faith of the 7 a proselytizing religion? If not, there there won’t be as much conflict with other faiths as medieval Catholicism (or medieval Islam) had.